Raised in Fairbanks, Alaska, Bryan Bailey grew to appreciate the wildness of the land and its abundant wildlife. In particular, he developed a fondness for the gray wolves that roamed the vast mountain ranges and forests near his home. Under the guidance of a Special Forces Survival Instructor, he spent years studying the social interactions of wolves in their packs and discovered that, beyond obvious physical similarities, there were also behavioral similarities between the wolves and the sled dogs that were his family's pets. Today, with over thirty years of education and experience studying wolves and other predators, Bryan has become a Master at understanding how nature has influenced the inner workings of the canine mind. Taking his cue from nature, Bryan utilizes her lesson plan to shape the behaviors in our dogs that are necessary for them to conform to our human existence. By doing this, and accepting the dog for the domestic wolf that it is, Bryan produces a dog that responds to his owner's commands with not only steadfast reliability, but with the spirit and vitality of the wolf. Bryan is currently busy writing his second book, "The Hammer - Understanding Canine Aggression." He hopes the book will educate readers about the most dominant tool in the wolf and dog's bag of survival equipment - Aggression (The Hammer). This tool has allowed for ingestion, digestion, reproduction and survival by wolves for thousands of years in a very hostile and competitive world and it was passed to our dogs. Its use by our dogs is often misinterpreted and misunderstood and this has led to an increase in avoidable attacks to dog owners and their children. Bryan and his wife, Kira, live on the banks of the Mississippi River in Memphis, TN, with their children, dogs and cats. Together they own ProTrain Memphis and Taming the Wild. Rarely does a book come along that so positively mesmerizes me that I read it from start to finish in a single sitting. Yet that is exactly what I did with Embracing the Wild in Your Dog by Bryan Bailey. Bailey opens the story with a reminder that with man’s domestication of the wolf to today’s “dog,” he changed the environment of the creature. Even so, dogs have retained the same base instincts that nature originally provided the wolf. Buttressing his approach to his theory of dog owning and training, Bailey tells of his childhood mentor, a U.S. Army Green Beret. A tough man, he was challenged by his mentor to solve problems on his own, to rise to overcome the stresses that life was sure to put in his path, and to learn from the nature that surrounded him. With heartfelt stories of his mentor woven throughout, Bailey instills upon his readers the same life lessons if they will but hear. With a daughter involved in the dog training world, I’ve been introduced to a wide variety of training theories, concepts, tools, and approaches. But Bailey reassured me that some of my deepest instincts about our own family pet are completely valid and that I ought to pay careful attention to them. In this way, Embracing the Wild in Your Dog provides pertinent information to all dog owners. In telling his story, it is almost as though Bailey inhabits the body of the creature he teaches us about. He guides readers to an understanding of a dog’s most basic needs, and he explains how our domesticated “wolves” behave in a manner intended to meet those needs. Bailey used what I would call a “creative non-fiction” approach to the work. That is to say, although his main intent is to provide information, he does it in a way that paints a picture of the world he wants his readers to see. That picture becomes a living, breathing canvas of color, sound, and even feelings. Bailey’s work is truly worthy of the attention of others and, in my estimation, of an award or two! If you are a dog owner, this one is definitely worth your while, so wait no longer to get your copy! Embracing the Wild in Your Dog is a non-fiction animal behaviorism work written by Bryan Bailey. Bailey is a dog trainer whose inspiration and understanding of his subject is derived from the years he spent in the Alaskan wilderness with his mentor, a Special Forces survival instructor. His hours in the outdoors were challenging and sometimes brutally tough training sessions, but the two of them formed an efficient and close relationship based on their love of the wild. As a child, Bailey had been indoctrinated into the cultural norm of fearing wolves, but his outlook soon changed as he learned about them and their ways from his mentor. He learned to track wolves and understand what they were doing based on the season and the weather. Bailey discusses the close relationship between dogs and wolves, asserting that dogs are indeed wolves, and he posits that an understanding of that wild nature is essential for anyone who has a dog in his/her life. Bryan Bailey’s non-fiction animal behaviorism book, Embracing the Wild in Your Dog, offers an illuminating and provocative insight into how dogs behave and how modern, more human behavior oriented training methods may be shortchanging both people and the dogs they love. While I’m intrigued by Bailey’s premise and will be looking into the concept of seeing the wolf in my two Labrador retrievers, I was particularly taken with his descriptions of the wilderness outings he had with his mentor. He shares with the reader the marvels, the lore and the occasional frustrations he experienced during those years of his tutelage, and I frequently found myself wishing I could have been there as well. Bailey’s guide to animal behaviorism is written in an easy, conversational tone that makes the reader feel personally connected to him. I’m looking forward to reading his upcoming work on aggressive behavior in dogs. Embracing the Wild in Your Dog is highly recommended. If I could give Embracing the Wild in your Dog by Bryan Bailey ten stars in every category, I would. Never before have I read a non-fiction book that enlightens, disturbs and inspires all at once, and leaves me wondering if I even took a breath from the time I opened the book. As I read the last page and checked Bryan Bailey's biography, I let out an audible sigh. If the sigh could speak, it would say brilliant and breath-taking. Embracing the Wild in your Dog is both of those. It is also a memoir and an instructional book. But its premise and its concepts may not be embraced or welcomed by all who cannot think of that little fluffy puppy in their laps as a wolf. But he is...at least instinctively, and Bryan Bailey makes sure you know that by the time you're finished reading. As soon as I'd read the first few chapters, I began looking at my little Shorkie, Duffy, through a different lens. I realized that when he first took a light nip of my granddaughter's lip and our gut reaction was to yell at Duffy for his bad behaviour while we wiped away her tears, that Duffy's reaction to having his neck grabbed in a hug constituted a threat and he was merely issuing a warning...as his now very distant forebears, the wolves, would have done. I have now learned that no amount of breeding these "fur covered humans on four legs" is going to breed out the wolf in him. As an Indian chief explained to the author's mentor, "Because a dog carries a wolf inside of him, he also carries the wolf’s prints. The wolf goes with him everywhere he goes." Sadly, today's dog owners live in denial of this truth. As a result, children and adults are being bitten and dogs are being euthanized, while vet bills and law suits drain bank accounts because we dog lovers don't want to acknowledge the wolf in our dogs. 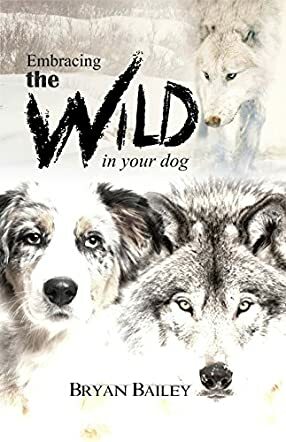 Embracing the Wild in your Dog by Bryan Bailey is also the story of a boy growing up in the harsh Alaskan climate and learning about survival from a soldier who had learned the same from studying wolves. At one point, this soldier took an accidentally self-inflicted bullet to his neck while the two were trekking in the frozen north. Weak and bleeding profusely, he continued the journey because the wolves had taught him that to lie down was to die. Yes, this book is all about being tough and that adage: "When the going gets tough, the tough get going". When Bailey shares stories like this or others about what happens in nature when animals face possible death, Embracing the Wild in your Dog becomes far more than just instructional: it is the beautifully moving memoir of a young man and his mentor. At times, readers may find themselves arguing, even outraged by Bailey's stance on how to raise and enjoy your beloved dogs, but I guarantee that after reading this book, you will never look at your dog again in the same way. The next time little Bella is being a "naughty doggie," you will find yourself questioning whether it is Bella or you who needs to be disciplined. Did you know that a dog, a house pet, is really a wild animal? A wolf, in fact? It's true - even the most unlikely tiny breeds of dogs have a link to the genetics of the wolf. It's hard to imagine since humans have befriended dogs and domesticated them as pets for centuries. But the 'wild' is still inside each beloved pet and to better understand the family dog, one must embrace his/her wildness and understand his/her wolf genetics. Author Bryan Bailey has studied wolves up close in the wilderness of Alaska. As a child, he had a Special Forces mentor who taught him how to survive in the Alaskan wilderness, a tactic that included understanding the wild animals, particularly the wolves. The author used this experience and knowledge and applied it to his expertise working with domesticated dogs, paralleling the inherent genetic similarities of wolf and dog. Although the author is a much sought after dog trainer, and particularly a coach for aggressive dogs, Embracing the Wild in Your Dog is not a dog training manual. Rather, Bryan imparts his knowledge of wolves and applies that knowledge to his understanding and appreciation of dogs. He shares anecdotes of his younger years, learning from his Special Forces mentor, as well as stories of dog issues brought to his attention by clients. He also shares the wisdom of many First Nations (aboriginal) people, quoting their understanding of the wild wolf and wildlife in general. "If you talk to the wolves, they will talk with you, and you will know each other..." This quote from Chief Dan George, as with the other quotes chosen for this book, helps sum up the human relationship with wolves and, subsequently, with dogs. Accompanied by numerous quotes, anecdotes of personal experiences, and superb photos, this is an excellent resource to help us better understand the 'wild' in man's best friend. I can’t remember anyone in my immediate family ever having a cat. We had lots and lots of dogs. We were a family of hunters. Embracing the Wild in Your Dog is not a training manual for dog owners. But I highly recommend this book by Bryan Bailey if you are a dog owner, or even just a nature lover. Dogs are a huge and integral part of human culture. They are everywhere and it behooves dog owners and parents to understand the true nature of man’s best friend. I grew up with dogs and know the truth of the principles set out in Embracing the Wild in Your Dog. My father taught them to me but he wasn’t nearly as articulate as Bryan Bailey. Before you can train your dog properly, you should know your dog’s true nature. That is what is learned in Embracing the Wild in Your Dog. Bryan Bailey teaches us this nature beautifully. Step by step, he shows us the nature of dogs and how we often fail them because we do not understand them. There are beautiful pictures and very pertinent insights throughout, insights Mr. Bailey learned at the feet of an awesome Green Beret while growing up in the Alaskan wilderness. The writing is simple but elegant and the anecdotes feature situations and dogs that Bryan has owned and known. I found the story of Rex and the grandson especially powerful. All animal lovers should read this book. It’s really about a lot more than dogs.